Chef Joel Olson has a wonderful Holiday offering for our culinary senses! Take this very popular and informative class to learn and practice the techniques that help take the chore out of cooking. You can use the techniques learned in this course every time you cook for the rest of your life! Techniques include: dicing onions, carrots and other vegetables; pasting garlic; boning a chicken; plus cutting assorted fruits. Knife selection, sharpening and care will also be covered. Bring your own knives or use ours. A light lunch will be served. Please contact the Innovation Kitchen at 608 987-3558 to register. Please note that the December classes will be held on Saturday, December 4, 2010. 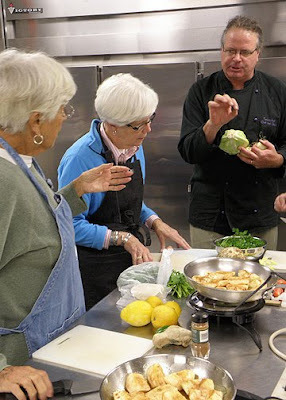 Everyday Cooking is a really great, intense, full-day course. It has been described as a "culinary boot camp." de Cuisine in Bethesda, MD, and always gets rave reviews. Our take-away idea for people when thinking about Iowa County, Wisconsin is 'Come grow with us'. Thanks to Chef Joel for his many contributions to this ethic! Innovation Kitchen events page and sign up information for Chef Joel's classes.